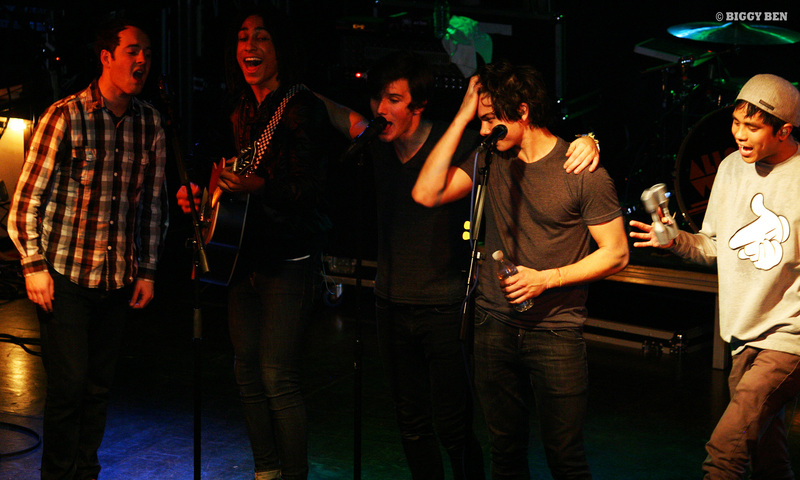 Allstar Weekend is currently riding the success of their new album on the Suddenly Yours Tour, alongside Stephen Jerzak, The Scene Aesthetic, and Action Item. This tour of young bands sure brought a smile to the young fans. Action Item started off the show playing songs from their new album “The Stronger the Love.” For an unsigned band, these guys sure have a ton of stage presence. They got the crowd clapping and singing along right away. Lead singer Brian Cag even jumped right into the middle of the crowd to sing a song, much to everyone’s delight. Having already played shows with Justin Bieber and Selena Gomez, expect to hear more from Action Item in the future . Next up was acoustic rock duo The Scene Aesthetic. Eric and Andrew, along with their backing band, brought a whole new dimension to the stage, being mainly acoustic guitar and vocals. These guys are always spot on. They sound great, their music is great, and they do a mean Taylor Swift Cover. Although this show, they covered “Down” by Jay Sean, they still made it sound even better than the original. Their new album “Brother” just came out and I definitely recommend you pick it up. For being so young, these guys really have their act together, and know how to produce top quality music. Stephen Jerzak took the stage next, after an hour set change time. Something went very wrong with the soundboard, and long story short, the venue forced Stephen to play solo acoustic. After expressing his anger, Jerzak played a very intimate set of his older material including “Cute”, “King”, and his always popular Taylor Swift cover of “White Horse.” Stephen was put in a crappy situation that night, and he made the best of it putting on an amazing set. While most might be fans of his new material, this was a great set for me, as I have been a fan since his early solo work, and finally got to see him perform it live. Stephen is a great guy. He spent most of the set change time talking with fans at the barricade while his crew tried to fix the sound problem. Now that Stephen has a major record deal, expect for him to blow up very soon! Until that time, check out some of his old material, it really is great stuff. Headliners Allstar Weekend were up next, and the crowd loved every minute of it! They kicked off the show with their hit “A Different Side of Me” and kept the show rocking from there. They played a full hour set of their catchy pop rock music, complete with a mini acoustic set half way through. The boys showed off their untamed energy bouncing around all over the place as they played. They even pulled a special fan onstage for the time of her life during “Amy” as she was serenaded by singer Zach Porter. These guys play some great music, and have tons of stage presence to back it up. Be sure to catch them on tour early next year with The Ready Set on the Glamour Kills Tour. Posted on June 11, 2011, in Reviews. Bookmark the permalink. Leave a comment.